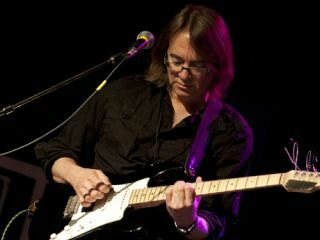 Jazz-fusion fans have long heralded the knockout skills of guitarist Wayne Krantz. Since 1990, he's released a string of widely acclaimed solo albums and has performed with such artists as Steely Dan, Billy Cobham, Michael Brecker, among others. But it's the release of his latest record, Howie 61, that is bringing Krantz a new kind of fame. Jam-packed with big-name players like bassists Tal Wilkenfeld and Pino Palladino, as well as drummers Anton Fig and Vinnie Colaiuta, it's a rocking and funking move away from the improvisational approach he's honed for years, and it's also notable for Krantz's wry vocals, an element he's explored before but never so dramatically. As ever, Krantz's fiery, wildly idiosyncratic guitar playing is front and center on Howie 61, and it's got some folks even calling him a guitar hero. MusicRadar talked to Krantz about the sudden rush of attention he's receiving and how he went about putting the new album together. Because of Howie 61, you're gaining a lot of new listeners. Do you feel as though you've been some sort of best-kept secret? "Well, I don't know. 'Best-kept secret' - that's like a catch-phrase that gets used to describe people who aren't household names. But I've been making my own music and surviving at it for almost 20 years now, so I'd say I've been pretty successful. To play uncompromising, non-mainstream music for so long, and to make a living with it, I can't complain. I'm doing OK. I've gotten a chance to play." Even so, the new album is getting a lot of attention. Some might call it your "coming out" party in a way. "And that's OK. It does feel that way to me, too. An album in this direction is something I've been trying to do for a long time. Adding lyrics, for example, to music that's been instrumental for two decades, that's been a big step. Things have to make musical sense. I'm pretty thoughtful about the whole process. I probably overthink and make everything too difficult, but that's just me. "The record before this one, Krantz Carlock Lefebvre, had some lyrics on it, so it was a toe in the water. It opened up my thinking to a way that I could see expanding and making a record like this one." You have a pretty diverse lineup of players on the record. Did it take a while to get everybody together? "Most of the people on the record are quite busy, so the scheduling did take a while. The sessions took place over a five-month period, so it wasn't like I got everybody in one room for a week. I don't think I could have done that. Recording was in different cities, different countries - we moved around quite a bit. "It's funny: To have an idea is one thing, but to actually pull it off, that's something altogether different. Figuring out who can play what and where and what studio we were going to use - I mean, it's possible. It just took longer that I thought it would. It wasn't like I had a multi-corporation doing it for me; I did it myself, really." Let's talk about some of the players you worked with. There's the drummers Anton Fig and Vinnie Colaiuta - how did playing with them affect your music? "They added their colors to things that already existed. This album is probably the least improvisational of anything I've ever done. The more improvisational something is, the more an individual can change what it is you're doing - and they can even alter it totally. In these cases, the songs were composed for these guys to play over. Their contributions were their colors. But for me, it was really fun to hear how they activated the music. I was listening to them as a fan." How about the bassists Tal Wilkenfeld and Pino Palladino? "It's a similar thing in a sense that they played the songs as they were written. They added some of their own stuff. Pino's bass part was only about 50 percent written, whereas most of the time I have it totally written. If write something out for the guitar, I write it out for the bass. So that was a new thing with Pino. I heard that he was very comfortable coming up with bass parts in the studio, so I left things open. And what he did was so incredibly perfect - I could never have written out what he did. "Tal had a pass part that I had written, but she ornamented it in a way that really energized the track. Sometimes if a musician is rendering a composition that's already been written, it can sound a little cold, but Tal came at it with real life and creativity. I couldn't be happier." You have a long history with playing jazz. How has it impacted the way you approach rock? "That's a cool question. To me, jazz always meant improvising. Improvisation could take place in any context, in any groove. I like the ideal of spontaneity, which is different from composition. I'm not a rock player, I'm not a jazz player, I'm not a blues player, and I'm not a funk player. But I use all of those things in what I do. So improvisation, which is what jazz is based on, has me grounded in such a way, and that's what I use when I do play rock." How did your cover of Ice Cube's Check Yo Self come about? "I was doing these cover gigs - for some reason, I wasn't in the headspace of doing my own music for a while - and I chose five different artists to cover. Each night would be one artist. One of the nights was Ice Cube. That whole riff from Grandmaster Flash's The Message, it's something everybody knows, and the song got a strong reaction. When it came time to do the album, I remembered it. I wanted to do something different, and it was a lot of fun. We used the main phrase as a departure point for improvising." The title of the song Can't Stand To Rock can be taken two different ways: somebody who doesn't want to play rock, or someone who's too drunk to perform. Some years ago, you played with Steely Dan. What was that like? They have a reputation for being taskmasters. "It was hard, but not because they're taskmasters - everybody is. I think they got that rap way back when because digital recording didn't exist. They had to get perfect takes. Plus, they had big budgets, so they could afford to sit in the studio and do things over and over and over. They clearly know what they want, but that's not unusual. I worked hard at doing what they wanted me to do, which was to improvise. I had to be in a certain vibe for them. It was challenging because you're in something that is very clearly defined." Your main guitar is a Tyler, right? "Yeah, it's a Tyler, a James Tyler, and it's kind of his version of a Strat. I used that guitar on the album, and I also have a 1967 Telecaster, so I used that, too. There's also a Godin acoustic that I played where that was appropriate." What kinds of amps do you use? "There's another guy named Tyler - John Tyler, no relation to the guitar guy - and I use his amps. They're really cool. I have a Fender '64 Deluxe that I used a little bit, and my Marshall 2553 Silver Jubliee head. On some of the sessions, I used a Bogner for some nice clean sounds." What were the effects you used on the record? "You know, I have a really cool pedalboard that Matt Brewster at 30th Street Guitars built for me, but I didn't go crazy with effects on the album. My sounds were a little more straightforward than on previous records - a little bit of distortion and delay here and there. I tried to make it as kind of up-front as I could."